remember when we dressed up to travel? Remember when we dressed up to travel? 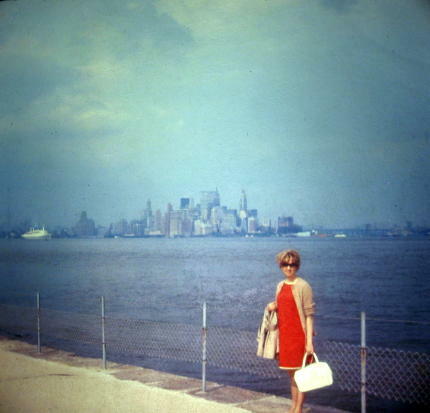 Not quite sure where this view of Manhattan was taken, maybe from Liberty Island. What’s really jolting, as I review it now, is how dressed up I was. I was fresh out of the south, and still used to wearing white gloves (and hats sometimes) to church on Sunday. I’d just gone to a new hairdresser, my first “stylist” rather than a plain beauty operator, and he knew exactly what to do to make my thin, limp hair look fuller than it was. (Daddy would have said I should just let it grow and not waste my money on such frivolity.) Just look what Charles did with my hair! I liked it then and still do, although most of the time it didn’t look that good. At the time Hubby and I were just friends who wanted to travel and you could take a Turbo prop flight for only $25 each way to New York City from Pittsburgh. You left early Saturday morning, stopped first in Buffalo and then one other place in upstate New York, before finally landing in time to deposit your luggage in the cheap hotel you’d booked for one night. I don’t remember everything we were able to do and see, but I remember the ferry to see the Statue of Liberty and the Horn and Hardart’s automated lunch counter for lunch, and Macy’s. The next day’s flight back to Pittsburgh followed a similar route in reverse. We didn’t mind getting home late, though, because we were young and didn’t need so much sleep, and we always looked forward to seeing the way Pittsburgh’s spectacular skyline and rivers seemed to explode in light as we merged from the city’s primary entrance from the south, the very dark Fort Pitt Tunnel as we drove to our respective apartments at the time–in Squirrel Hill and Monroeville. And that’s the way it was in 1968. Cheap flights, enough energy to embark on such a hectic schedule, and on my own and able to do something without anybody’s permission for the first time in my life even though I was already 25 . Life was getting good! As for that purse; I’d never carry one that big now! After 40 years of traveling together and being married to him, I know I’d just wind up carrying Hubby’s mobile phone and wallet and every travel brochure New York had to offer, maps too, if there were any, while he saunters happily and carefree several yards ahead of me. Remember when we dressed up to travel?” is the first of what I hope will become a regular feature to appear every Sunday (naturally) under Sunday Snapshot Musings to be continued, hopefully, until I’m out of snapshots to write about. Of course you realize that means I’ll probably have to post someday from the grave–if I can figure out a way to do it. What a nice idea. I’ve been trying to remember all my early trips to NYC, but they all blend together. We went to the Automat, but our favorite was Mama Leone’s–very theatrical, lots of food and cheap. I think I abandoned white gloves some time in the fifties. That’s the difference coming from “sophisticated” Chicago. I’m so glad you liked the idea, Ruthe. I often fear I’m sounding so egocentric by putting anything with my picture being the feature (even on my travel posts) but decided to fight it and do it anyway because remembering when is part of my wintersong after all. Every time I look at old photos it releases a flood of memories, and I enjoy seeing how things were and how they are now. I hope you will consider doing similar postings of your own. I, for one, would really enjoy it. P.S. Your comment about Mama Leone’s is so on the mark. When I worked a conference in NYC in the fall of 1968, our group (my co-workers from the Instrument Society of America) took a cab there and I enjoyed my first authentically Italian chicken parmasan. The real piece de resistance of the evening came, however, when a guest (and it may have been someone famous, sad to say I can’t remember) got up and sang an aria from Madame Butterfly, One Fine Day. I can still feel the goosebumps that sprang up along my arms. I’m sure there were some beatnik types wearing black in the village, but if you watch Mad Men, which I think is set right in ’68 and in NYC, you’ll see lots of women wearing dresses that are full of color! I actually don’t remember what people were wearing at the time. I just assumed I was one step out of sync with the rest of the world the way I was then and now. See? That’s why I’m trying to scan all those old slides! Otherwise you’d never see who your parents were before they became your mom and dad. Your photo won’t download. Sniff. That’s a problem I sometimes find with WordPress. However, I love your description of the fashion and the times. I remember taking road trips with my parents in the late 50s and early 60s, and Daddy insisted that we look tubbed and scrubbed even though we were going to spend 8 to 10 hours in the car. Of course, he didn’t demand dress and gloves attire, but we did wear our best bermuda shorts or clam digger outfits. Mom often sewed cute new blouses just for that occasion. Thanks for the memories. It’s nice to hear from you again. I’m really sorry you had problems uploading the Sunday photo. I’ve been having intermittent problems for several weeks now with losing photographs (they seem to drop off for no reason), and just haven’t been able to figure out why. First they’re there and then they’re not. I really appreciate your letting me know about the problem, and I’ll keep plugging away at it. I appreciate your comment, and the memories you shared as well. I have old pics of my mom taking us shopping on Canal Street in downtown New Orleans – gloves and hat. I love the hair and the dress – red is my favorite color. BTW – I’m two thirds through my Theroux book, his 33 years later version of the Great Railway Bazaar – his big lament is the changes to the Indian cities he had visited years ago – how much they have grown and changed. Would you believe New Orleans is one of the few major cities in the south that I’ve never visited?! I hope to get there someday. Canal street is the main drag where all the great restaurants and hangouts are? As for the book, I think you must mean THE IMPERIAL WAY with photographs by Steve McCurry? That is one of my very favorite books in my library. My favorite photograph is about midway through–the little boy and his father on the way to market with his pet goat. What a story it tells! I’ve ridden if not THE baby train, one very like it when I traveled to Simla. We liked to joke that you could stick your head out the window and see yourself coming and going. Ladakh might be our destination next summer when we travel to India. I’m eager to do the train travel again. I look forward to the photos of the past. I have a wall full of family photos covering 100 years! In 1968, I wore bright colors, too, and usually something with a psychedelic print. Chances are I would have made my outfit because it was all I could afford. Oh, yeah, there was that little leopard skin number. Wish I still had that.